It's here and this is an event that you don't want to miss. What's going on you ask? Well over 200 bloggers have joined together create the premier fashion event in blogging. All of us will be giving away a prize worth over $50 each. And let's not forget the grand prize. For every contest you enter, you will get one entry to a contest for a Fendi Mini Beige Red Pochette Bag from Bella Bags. Now how is that for fashion. I am loving that bag. Now I bet that you are curious what I am contributing to this wonderful event. 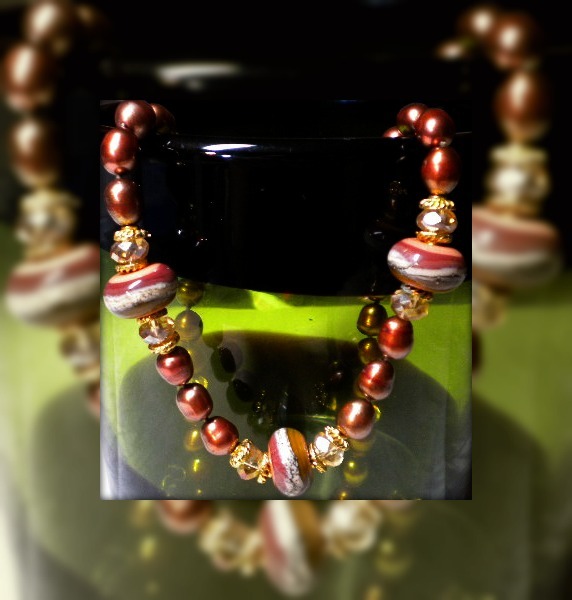 It is a hand-knotted necklace made of freshwater pearls, lampwork beads from JulsBeads, and Egyptian crystal. This is a necklace that I designed myself and has to be my favorite. I really had to talk myself out of keeping it and making up another completely. 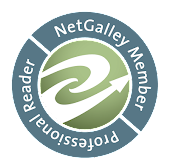 I want to give my best to my readers. Here is the pictures and I guarantee that it looks much better in person. It is pouring rain here it Tacoma and I couldn't get any good pics. Now as to how to enter. I am going to make this simple. Just leave me a comment. For extra entries there are a few options: follow me, tweet about this contest, or share it on Facebook or your blog. Please leave a comment for each. This contest will close on the 20th however since I won't be available until Sunday the 23rd so I will post the winner then. And now it is time for the legalese. Still Blonde after all these YEARS , Fall Fashionista Giveaway Events or the Fall Fashionista Giveaway Event bloggers are not responsible for sponsors that do not fulfill their prizes. These are pretty, I'd love to win! Thank you for the lovely giveaway! The necklace iz beautiful! The necklace is simply superlicious! Thanks for the lovely giveaway. thank you for this giveaway. i like the necklaces ^^ beautiful colours. How pretty. Thanks for the giveaway. Gorgeous necklace!! I love JulsBeads too!! Love your site! I’m your newest follower on GFC! I’d love to have you as a follower on the PS Beauty Blog too! Thanks for the giveaway! I think my mom would like the jewelry. 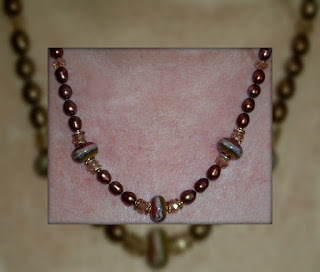 Following you via GFC as Julie D.
Beautiful necklace, thank you so much for the giveaway! Oh that turned out fabulous! Gorgeous work, hun! I love pearls, this necklace looks amazing! The necklaces are gorgeous and would fit well with my fashion choices. This would be great wrapped under my tree with MY name on it. 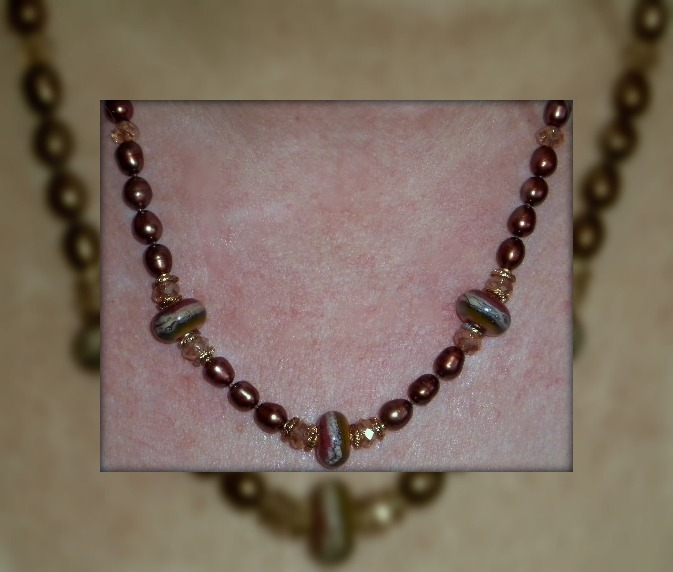 yes pretty and metallic beads necklace . I think its a stunning necklace, thanks so much for the chance to win it! Thanks so much for the chance to win this gorgeous necklace! That necklace is beautiful perfect for fall. I follow as Laura P. on GFC. Love the necklace! Thanks for the giveaway! Thanks for the chance! I love jewelry! I think they are very pretty necklaces, thank you for the giveaway! What a beautiful necklace! Amazing work! Thank you so much for offering such a wonderful piece for this giveaway. I would like to share my current favorite quote: Don't be pushed by your problems; be led by your dreams. I am now following you with MyYahoo! Thank you so much for the chance to win the giveaway. Thanks for the chance to win this pretty necklace. Thanks for the Giveaway.Lovely necklace! Great giveaway, I love love love pearls! Thanks for the chance to win! Thanks for the fab giveaway! Beautiful jewelry! Hi! The necklace is beautiful. I am joining this contest! Thank you so much for participating in the blog giveaway! Woo hoo! This is pretty! Thanks for the chance to win! I think your necklace is gorgeous. I love your color choices! The necklace looks pretty in the pics so it must be stunning irl. What a lovely necklace, so stylish. thanks for the giveaway and visit, too.